The “Windfall Elimination Provision,” or WEP for short, provides a formula to adjust Social Security payments for people who held jobs—often with state and local agencies—where Social Security taxes were not withheld from their pay, and jobs where they did pay the taxes. Teachers who have other employment during their summer months off, or firefighters who moonlight in between 48-hour shifts, are examples of public employees who can be affected by the provision, which was passed by Congress about 35 years ago. The provision is meant to prevent people from collecting excess Social Security payouts they didn’t pay taxes toward, alongside pension benefits in retirement. But critics argue that the WEP employs an imprecise formula that leaves some retirees shortchanged. “It takes too much money away,” said Shawn Duhamel, legislative director for the Retired State, County And Municipal Employees Association Of Massachusetts, also known as Mass Retirees, a group that advocates on behalf of retired public workers in the state. 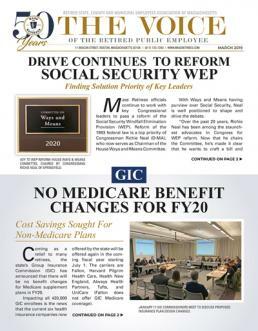 Identical bills introduced in late September in the Senate and House aim to overhaul the WEP, so the Social Security benefits retirees receive are more proportionally aligned with the years they were working in jobs covered and not covered by the program. Ways & Means Chairman Kevin Brady, a Texas Republican, and the committee’s top Democrat, Rep. Richard Neal of Massachusetts, introduced the House bill. Nineteen other lawmakers have signed on to the House legislation, 17 of them Republicans. Sen. Ted Cruz, Republican from Texas, is the lead sponsor on the Senate text, which has yet to attract any cosponsors. “WEP, though well intentioned, has treated many of our public servants unfairly,” Brady and Neal said in a joint statement. The revised formula in the bill would apply to future retirees who are 55 and younger today, a Republican aide explained last week. Benefits for those who are older would still be governed by the existing WEP formula. But people in that category would also be eligible for a $100 monthly payment, to help defray benefit reductions. That payment would rise based on a cost of living adjustment. If applied for current beneficiaries in 2018, the legislation would affect the benefits of about 1.6 million people whose Social Security benefits are reduced under the current WEP formula, according to a memo the Social Security Administration sent to Brady last week. The memo adds that, in the long run, the proposal would mainly affect the roughly 25 percent of all state and local government employees in the U.S. with earnings not covered by Social Security taxes. Between 2019 and 2028, the Social Security Administration estimates that the bill would increase the cost of the Social Security program by about $25 billion. But over a 75-year timeframe, the proposal is expected to slightly improve the program’s finances. Jim Pasco, executive director of the National Fraternal Order of Police, one of the nation’s largest police organizations, indicated that his group is among those on board with the bill. “We strongly support this badly needed legislation,” he said by email last week. Duhamel said his association is pleased with the interest in reworking the provision as well, noting that about 70,000 retired public employees in Massachusetts are affected by the WEP. But the path ahead for the legislation could be thorny. Brady’s attempts to tackle this issue date back over a decade, to around 2004. He and Neal most recently tried to push a WEP measure in 2016. That effort failed despite support from groups like the AARP. Replacing the provision promises to be a balancing act. Lawmakers are trying to address concerns about the WEP, while also seeking to ensure that people nearer to the end of their careers, who have planned around the existing law, aren’t negatively affected by any changes. The cutoff age for workers who the new formula would apply to, a variable that effectively dictates how quickly changes are phased in, tends to be an especially sensitive topic. Groups including the AARP and the Ohio Public Employees Retirement System, which showed an interest in the Brady-Neal bill in 2015 and 2016, said by email last week they haven’t yet taken a formal stance on the latest legislation. The National Council on Teacher Retirement, a group whose members include 68 pension systems, said the same. “We’re studying the proposal,” the group added. The effects of the WEP on a person’s Social Security benefits depend on how much they worked in jobs where they had taxes for the program withheld, or not withheld. And estimates in the Social Security Administration memo show that the proposed overhaul of the formula could have mixed results depending on the situation a person is in. For instance, about 1.1 million beneficiaries now subject to WEP reductions would receive an additional $74 per month, on average, under the legislation. But about 13.5 million other people who are subject to the WEP, but do not have their benefits reduced under the current formula, would see their monthly benefit decrease, on average, by about $29 per month. The fact that Social Security is a progressive program helps to explain the WEP’s origins and structure. For people with lower than average earnings, the ratio of Social Security benefits they receive, compared to the taxes they pay, is higher than it is for people with higher earnings. This creates a situation where if the government were to look at a person’s lifetime earnings and consider only the portion covered by Social Security, without accounting for pay from an employer that did not withhold taxes for the program, it would appear as if the person is a long-term, low-wage earner, due greater Social Security benefits. The WEP was designed to correct for this by taking into account the time a person spent working in positions not covered by the program. Whether a state or local government employer withholds taxes for Social Security varies between jurisdictions across the U.S. But California, Massachusetts, Ohio and Texas are states where a substantial number of workers are affected by the WEP. Duhamel explained that the entire Massachusetts public workforce is outside of Social Security. The reasons for this date back to the advent of Social Security in the 1930s, when state employers with pension systems were initially barred from participating in the program. That would later not be the case. But Duhamel said that, by that time, the state’s pension systems were well established and major changes would have been disruptive. Some of the potential snags with the new legislation have to do with what’s sometimes called the “30-year rule,” which involves the mechanics of the existing WEP. Social Security benefits for most people are calculated by applying three percentages to their “average indexed monthly earnings.” In 2018, these figures were 90 percent of the first $895 of these earnings, 32 percent over $895 through $5,397, and 15 percent over $5,397. The WEP dials down the 90 percent figure to as low as 40 percent, in five percentage point increments, depending on how many fewer years than 30 a person worked in a job where they had taxes for Social Security withheld. For a year to count toward the time requirement, a person needs to hit a “substantial earnings” benchmark, which was $23,850 in 2018. If a person logs 30 eligible years of employment in jobs covered by Social Security taxes, they’ll get the full 90 percent figure factored into the calculation of their Social Security benefits under the current system—even if they are subject to the WEP because of another job. But a person with fewer than 20 years of covered employment would only see 40 percent of their first $895 of earnings factored into their benefits (although there are some other technicalities that guide this calculation). For people with between 21 and 29 years of covered employment the figure ranges from 45 percent to 85 percent. The maximum amount a person could see their benefit reduced by the WEP in 2018 is roughly $447 per month, or about $5,370 a year. That’s for someone with 20 years or less of substantial earnings covered by Social Security. By comparison, someone with 29 years of covered earnings could see a reduction of just $44.80 per month. Duhamel noted that the way the math works with the proposed legislation, people affected by the 30-year rule could have their benefits dinged. “Not by a lot, but for some people it could be $10 a month, it could be $50 a month,” he said. Here there are questions about whether the age threshold for applying the changes outlined in the bill is the right one, or if it should be set at a younger age to give future retirees more time to adjust. “You can’t simply change the rules on people who are getting close to retirement age,” Duhamel said. An attorney who works with public employee retiree groups and who is tracking the legislation said there is still work to be done to bring all of the interested parties together. “I don't know that Brady and Neal have threaded the needle yet,” the attorney said by phone last week. “But they seem to be getting closer,” he added. The lawmakers themselves seem to acknowledge as much.